This inshore schooner (foremast shorter than mainmast) is awaiting repair of sail and running rig. Its long bowsprit, thin masts and delicate standing-rig make for an intriguing picture study, but it is not an offshore, seagoing sailing vessel. Catching a pot of gold at the end of a rainbow is a photographer’s favorite feat, because it makes for a challenge, and takes some luck. The sun needs to keep shining, and lining up a subject with the rainbow is a constraint you have little control over. Some will think this is a photo-composition, a montage, but it is not. The cloud bank approached the sun, the rain came closer, the picture materialized. All Photos on Outbound are original work, copyrighted © 2012-2015 by Whitt Birnie. Technical notes: Digital bridge camera, 6-meg images, 30mm to 300mm zoom lens. Screens test correct for most browsers, tabs and pads. 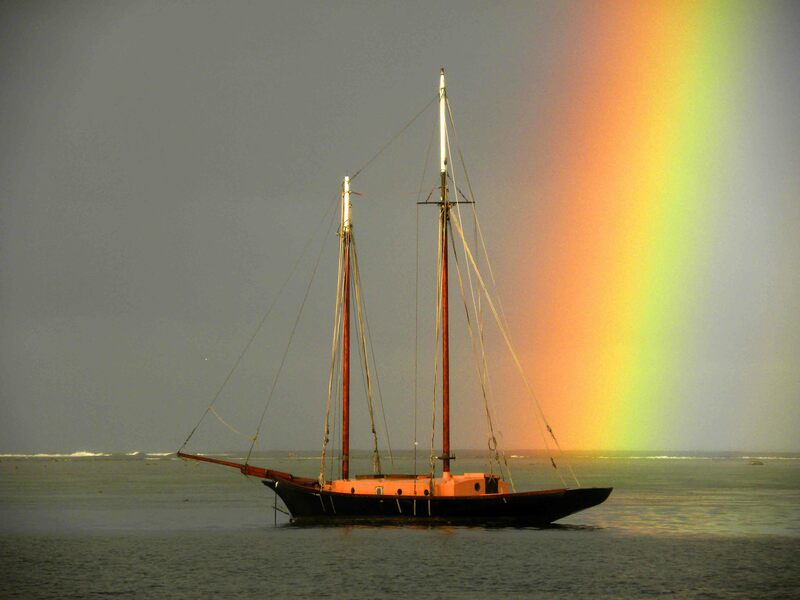 Tags here: color photography, rainbows, spectrum, water, sailboats, lagoon, rain. Then moon, full moon, horizon at dawn, early dawn, daybreak. Schooner: two-masted vessel. Sunlight streams thru the rain-bearing clouds, turning the sky gold just before sunset. Passage from night to daylight, a pink dawn breaks the spell of fading moonbeams. Moon sets near dawn. The long bowsprit awaits sail, longing for wind energy to breathe new life into it. Dawn sky near moon-set. Island summit casts high shadows thru the sky over the schooner.